measuring instrument has perfect precision. measurement. 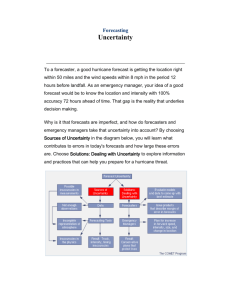 An uncertainty is not an error. Whenever two measurements are added together, the actual uncertainties are added. Whenever two measurements are subtracted, the actual uncertainties are added. Whenever two measurements are multiplied together, the percentage uncertainties are added. 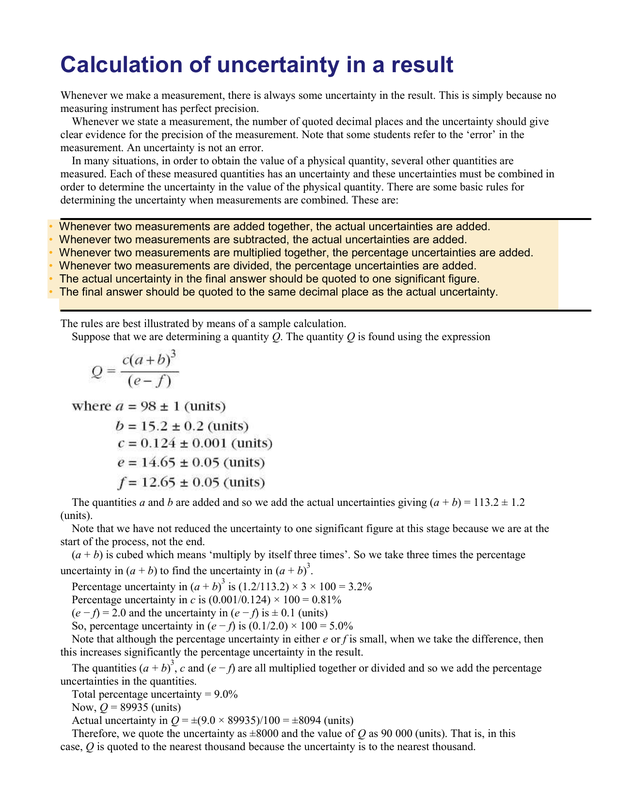 Whenever two measurements are divided, the percentage uncertainties are added. The actual uncertainty in the final answer should be quoted to one significant figure. The final answer should be quoted to the same decimal place as the actual uncertainty. The rules are best illustrated by means of a sample calculation. start of the process, not the end. 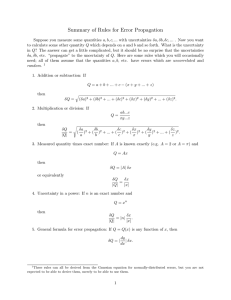 uncertainty in (a + b) to find the uncertainty in (a + b) . this increases significantly the percentage uncertainty in the result. case, Q is quoted to the nearest thousand because the uncertainty is to the nearest thousand. of Q is therefore written to the same number of decimal places. depending on whichever is appropriate. 26.4308 is expressed to four decimal places, etc. calculated or the quantity is measured. This is explained for the examples above in the table on page 10. 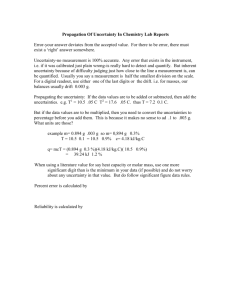 The number of significant figures is the number of characters shown in an answer or a quantity. 6.345 is quoted to four significant figures. Note that the number of significant figures does not take into account the position of the decimal point. been quoted to one, or two, or three significant figures? 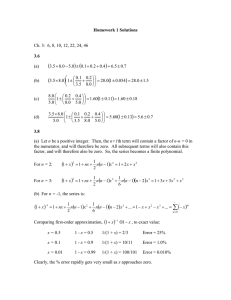 This problem is overcome by using index notation. 0.0063 has two significant figures. of significant figures. This is usually either two or three. 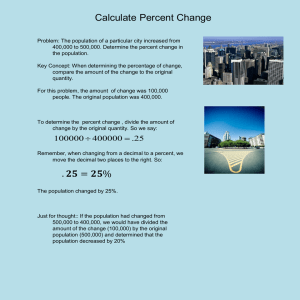 Suppose the data for the calculation is given to two significant figures. individual part should retain two significant figures more than is intended for the final answer. of the instrument that is used to make that measurement. length to be between 55 cm and 64 cm. length to be between 63.5 cm and 64.4 cm. For an ammeter with scale divisions of 0.2 A then an appropriate value of current would be 4.7 A.
would not be acceptable because one value has lower precision than the rest. coordinates are quoted should reflect this precision. 2 mm squares between the 2.0 V mark and the 4.0 V mark is 10. Then each 2 mm square represents 0.2 V.
coordinate as, for example, 3.7 V. Quoting it as 3.70 V would not be acceptable. reliability of the measurement. That implies the degree of uncertainty in that answer. should be remembered that an uncertainty is not an error. 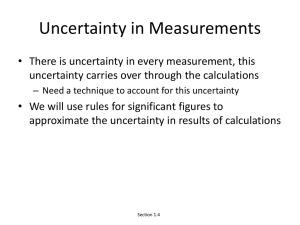 the uncertainty is in tenths! Secondly, the final answer should be quoted to the same number of decimal places as the uncertainty. The final answer and its uncertainty should be quoted to the same number of decimal places. tenths. There would be no point in quoting the answer to hundredths or thousandths. level of your studies, you should be able to distinguish between them. multiplied by that same number. relation P = kQ where k is a constant. Direct proportionality can be represented by the graph below. Note that the line must pass through the origin. proportional to the square of Q. That is P = cQ where c is a constant. Proportionality can occur with any power of Q.
quantity, then the other is halved. Inverse proportionality can be represented by the graph below, where P is plotted against 1/Q. Inverse proportionality can occur with any power of Q. Note the difference between proportionality and linearity. For proportionality, the ratio of the two quantities that are proportional is always constant. 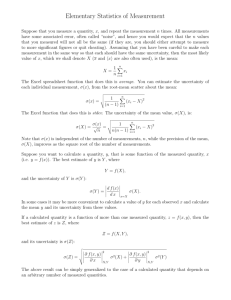 For linearity, the ratio of the changes in the two quantities is a constant. Linearity can be represented by the graph below. R = a + bS, where a and b are constants. The constant a is the intercept on the R-axis. gradient b and an intercept on the R axis of a. (anomalous point) can be detected and allowance made – perhaps taking a new set of measurements. The constant c is the intercept on the y-axis. case with c = 0 means that y is proportional to x.
constants. 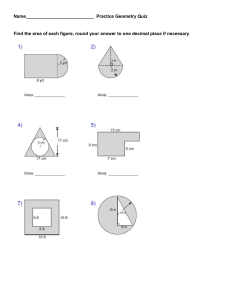 Some examples of this technique are shown in the table below. 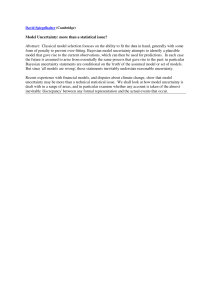 Model Uncertainty: more than a statistical issue?